The Dance City Academy Tour Group is supported by the Dance City Academy Performing Arts Society - a not-for-profit group created to assist the group in meeting it's program goals. 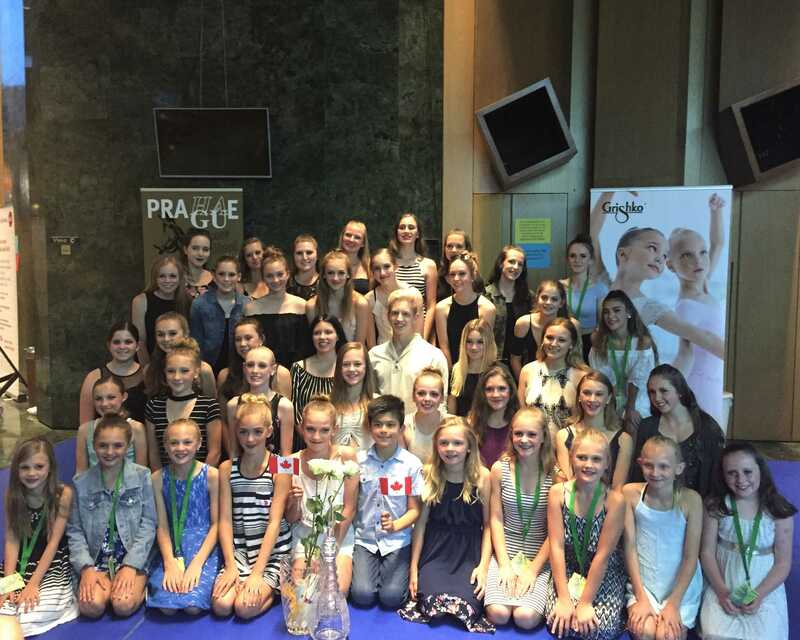 The 43 dance students, aged 9-17, with teachers Aniko Kryski and Cheryl Blumke and eight parent chaperones, travelled to London, Prague, Czech Republic, and Berlin, Germany. They attended workshops and visited the Pineapple Dance Studio in London. On Canada Day's 150th birthday, the dancers arrived in Prague and, dressed in Maple Leaf T-Shirts and hats, sang O Canada in the streets of the Czech city. The highlight of the trip was being the first Canadians, to compete at the New Prague Dance Festival and winning the Junior Grand Prix and 500 euros. As a youth performance troupe, the group offers dedicated dancers the opportunity to immerse themselves in the art of dance, beyond their regular studio training. The group trains in jazz, ballet, tap, modern, lyrical and musical theatre and has taken part in dance competitions throughout British Columbia, Alberta and Washington State. The dancers regularly receive top placements and scores. Past touring groups have traveled to California where they performed at Disneyland and Knotts Berry Farm and attended dance workshops at The Edge Performing Arts Center; Mexico where they performed on board Carnival Cruise Line’s MS Splendor; New York City where they performed at the Morgan Stanley Children’s Hospital and the Naumberg Bandshell in Central Park; and a California Tour where they performed in Disneyland, attended class at Debbie Allen Dance Academy and traveled to San Francisco for additional performances and dance workshops. In addition to their major trip, the DCA Touring Group performs at various local events and care homes. The group regularly participates in fundraising efforts to support the goals of the program. Funds raised are used toward the group's performance related expenses and to assist the group in the costs related to their performance & educational trip. Clothesline - Canadian Diabetes Assoc. Would You Like to See The DCA Touring Group Perform at Your Next Event? The touring group is able to provide a high-energy, family-friendly dance show for your event. Whether you want 10 minutes or our full 30+ minute show, the group would love to dance for you. In addition to the full dance show, the dancers can answer questions from the audience and/or teach audience members a short dance combination. For more information on booking the group to perform, please contact Dance City Academy Performing Arts Society.